Two years ago today (31st July 2013) I posted my first Tweet as Big Up the NHS. A lot has happened since then and perhaps now is a good time to reflect on what has been achieved and consider the future. It started with an article in the Telegraph in April 2013. It caught my eye because it was about my hospital. A patient had been told he had lung cancer based on an Xray but in the end it turned out that the problem was caused by a garden pea that had “gone down the wrong way” and had lodged in his lung. The article was critical of the doctors concerned and made no effort to convey their side of the story. It felt unfair and misleading. The fact that the appearances on the X ray would be due to lung cancer 99.9% of the time was not mentioned. The thing that really irritated was the description of the treatment by doctors as “frantic”. I knew the people concerned and I was sure they would be professional and caring – even in a crisis. They would never appear frantic. This journalist had not been there but had spiced up his story with an unjustified swipe at the medical staff. I know the NHS isn’t perfect. But from then on I started to notice a pattern in the press. 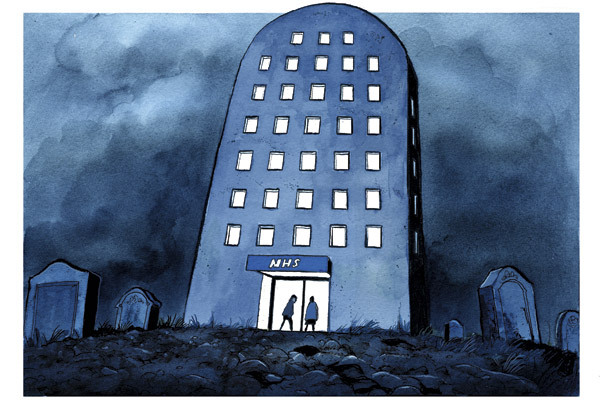 Almost every article seemed based on the premise that the NHS was failing, that staff were uncaring, that managers were incompetent and that patients were the ultimate victims rather than beneficiaries of the system. It seemed unfair and it slowly dawned on me that it was actually damaging the NHS and would cause real harm to patients. Patients’ experience of treatment is coloured by their expectations. If you think you will receive poor treatment you will focus on the negative, see the problems, be more frightened and have a more distressing experience. Imagine you are about to board a flight and you read in the newspaper that the airline has faulty equipment, pilots are poorly trained and that you have a high chance of crashing. At the very least your enjoyment of the flight will be curtailed. Most people would decide not to fly or to switch airlines. But choosing to avoid necessary treatment is harmful in its own right. There is good evidence that patients’ outcomes are influenced by their expectation of success. Complication rates will be increased and some may even die. The casual unjustified swipe at the NHS in the media will cause real harm to real people. And it devastates staff morale. The vast majority of people who work for the NHS staff are caring, dedicated and sensitive. Indeed most clinicians are selected for these qualities at the start of their careers. Unjustified bad press is hurtful, it damages morale and desensitises the sensitive. Sickness rates increase, staffing levels fall and patients have a bad time. The press gets even worse. We hit a relentless downward spiral. Why is the press so bad? A charitable explanation would be that the journalists are driven by a desire to improve the NHS. But if that was the case then we would see some hint of encouragement and suggestions for improvement in future. This is hardly ever seen. I don’t buy this explanation. Five years ago NHS satisfaction was at a record high. Our outcomes were world class though we spend less per head than most equivalent countries. We had higher patient confidence, fewer errors, and far higher satisfaction with the overall system than countries including France and Germany. Almost every measure of efficiency and patient satisfaction has been steadily improving in recent years. Can things really have changed so quickly? Perhaps the service has really got worse? From the inside it doesn’t feel like that. And most of the news reporting tells us that this isn’t a ‘new’ problem. Some have said that the bad press is a political plot to undermine the NHS and make it ripe for selling off. I can see the logic of the argument, but I’m not a natural conspiracy theorist. I find the idea that a whole party would deliberately destroy the NHS for its members own individual personal enrichment, unlikely. The sad truth is that knocking the NHS has become the fashionable thing to do. As a nation we enjoy a sense of righteous indignation. Journalists have come to believe that feeding this appetite will sell papers. It is all about circulation, profit and short-sightedness. We are destroying our only reliable source of comprehensive health provision. We are all dependent upon it for cradle to grave yet we collaborate in demonising it. We are engaging in societal self-mutilation. Each time I saw a negative press report my feeling of discomfort increased. Two years ago I decided I had to do something about it. The idea of using Twitter to promote the NHS came to me while I was out running. The name ‘Big Up the NHS’ just popped into my head and I had the whole thing worked out by the time I got home. At the start I didn’t add my name to the campaign. I was a medical director in a big trust and was worried about taking an approach that seemed subversive or anti-establishment. In any case it was about the NHS, not about me. There was never any intention to take a political stance or support a particular party. 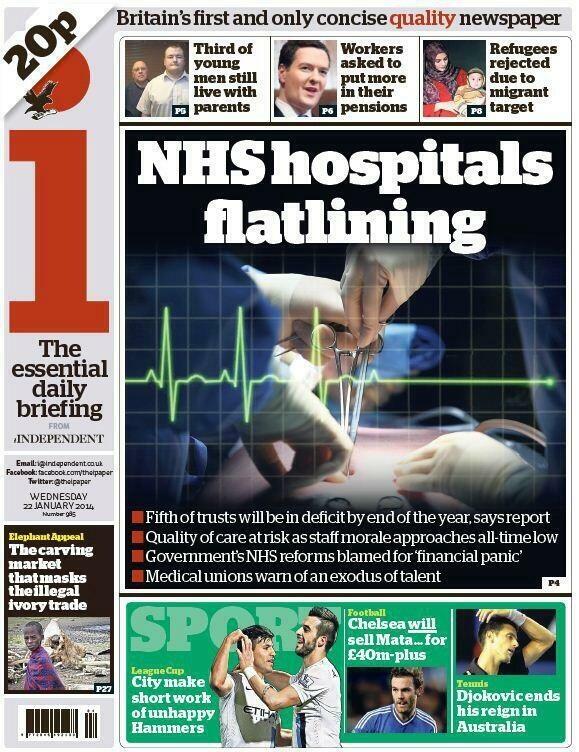 This was purely an attempt to reverse the negative spiral and improve the NHS for staff and patients. In January 2014 I decided to add my name to the site. 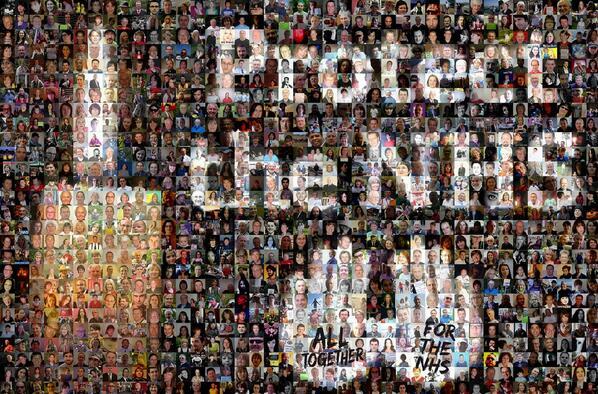 Some tweeters had implied that I was a front for NHS England and it felt a bit dishonest to be tweeting anonymously. My “coming out” was well received. 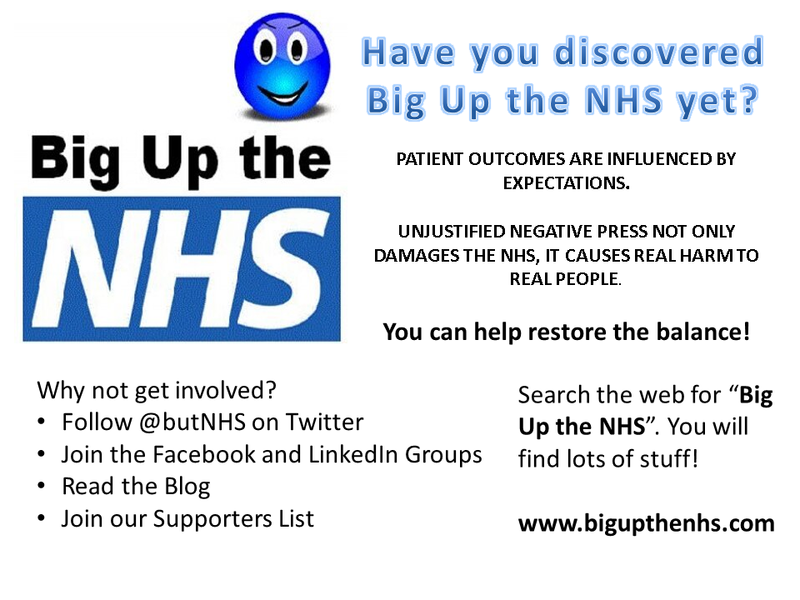 The Big Up the NHS Group on Facebook started shortly after the Twitter account. I will be eternally grateful one early member who started a campaign to get the numbers up and added the first 1,000 over a weekend. From then it grew slowly to about 4,000 on the eve of the General Election in May this year. I was somewhat anxious about the result as I felt it would not be good for the NHS. It is a public group and members can add their friends so I posted a pleas for people to enrol their friends at 6 in the evening before I went out with friends for a meal. When I got home the group had grown to 17,000 and the following day reached 25,000. We are now pushing 30,000 and still growing. The Facebook group has real influence and in many ways is the powerhouse of Big Up the NHS. The blog was started in January 2014 with an inaugural message from Kate Grainger (of #HelloMyNameIsfame). I had never done anything apart from scientific writing before so it was a challenge to write material for it at first. But I persisted and it got easier. The blog is now read quite widely with some post having 10s of thousands of views. There is also a web site. I am very grateful to Bob Pando, a work colleague of my wife who helped me to set it up and taught me about web design. I did most of this in the first 18 months on my own – not an easy thing as a full time hospital consultant. I put out occasional, slightly desperate pleas for help which largely fell on deaf ears. Happily I now have collaborators! Jo, Greet, and Claire all contacted me directly and volunteered their help. We work pretty democratically and it feels like a proper team effort. You can read a bit more about the team on the web site. Regular followers will have sensed a change of emphasis. Spreading good news stories remains the core business but we are also now very much involved in publicising the risks to the future of the NHS and trying to influence politicians of all parties to ensure that it is protected. There is potential to do more. Small Big Up the NHS groups have been started on YouTube, LinkedIn and Google+ but I have not had time to develop these. I would like to do more with the web site too. With social media as with so many things, size is important and I would dearly love to have more members and followers. Please have a look and see what you think. 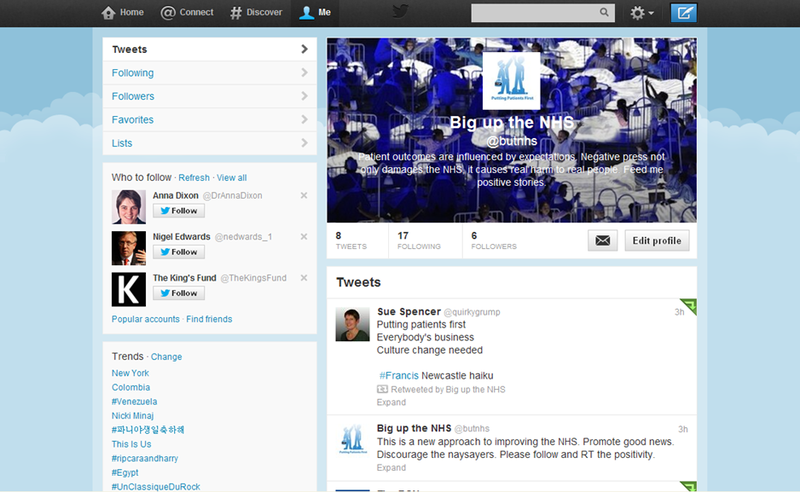 If you are interested in what we have been doing and would like to help, please get in touch via admin@bigupthenhs.com. Let’s hope the next two years prove as successful and we actually start to make a real difference for the staff and patients of our wonderful National Health Service.